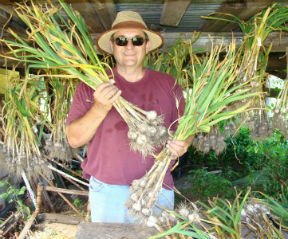 Harvests mid-summer - a rich yet mellow garlic that stores into spring at room temp. Georgian Crystal is a large and beautiful porcelain garlic with delightfully robust flavor but not very much hotness. If you want a richly flavored, long storing Porcelain that won't burn you out, this one's for you. 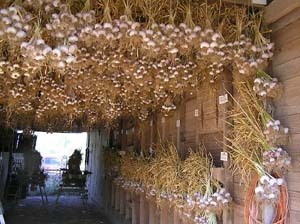 From a grower's perspective, it is a large and healthy garlic to grow and appears to be relatively resistant to most of the diseases that can affect garlic. It originated in the Republic of Georgia, the former Soviet republic between the Black Sea and the Caspian Sea. An excellent garlic for raw eating and in pesto, salsa, etc.